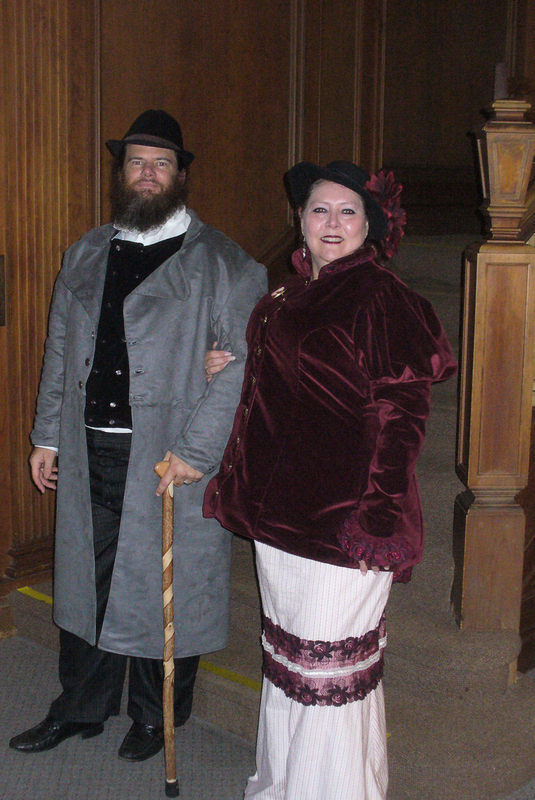 Kim Richards, escorted by Wiliiam Gilchrist, at the Haunted Mansion. Photo by Dan Weidman. Kim Richards is an editor, author, and small press publisher. Born and raised in Roswell, New Mexico, she presently lives in Northern California with her husband and two feline supervisors. Kim found both Haunted Mansion Writer’s Retreats very inspirational and fun. She contributed short stories to both volumes of the Haunted Mansion Project. KR: I’ve never had paranormal experiences, outside of feeling a protective (angelic) presence when I was young and during my second marriage, which was abusive. Thank God, I have a wonderful husband now. I do get premonitions, as my great grandmother called them, where I feel something happening to someone or is about to happen to someone. KR: A few years back, my husband’s company sent him to Boston for a year. I went to visit him and we did a ghost/cemetery tour in Plymouth, Massachusetts. We picked up quite a few orbs in photos. We also did a ghost tour of Gettysburg the year we went to Horrorfind. KR: The first year, I thought I heard someone walking between the beds in the middle of the night. I didn’t see anything, though. Now, I wonder if what I heard was the person rooming next to me walking around in his room. I’ll never know for sure. KR: During Year One of the retreat, someone told us hippies lived on the property in the Sixties. Then during Year Two, I listened to Dan talk about his possession experience. The depth of his belief was so profound to me. I wondered if it were possible to create an evil entity just by believing strongly it existed. I combined the two elements and wrote “Manifestation.” It’s a story set in the Sixties where a young man—suffering from PTSD (yeah, I know they didn’t call it that back then) from the Vietnam War—tries to join a hippie commune. What his fear and anxiety create threatens them all. I had a lot of fun with this story. Kim and Sephera Giron, photographed by William Gilchrist. KR: Oh, yes. William and I have already paid for it. KR: I have several novels in various stages of revision. I’ve hesitated to publish them through our own company for fear of putting a self-pub stigma on my authors. However, I’ve come to realize I was only getting in my own way. I plan to finish these up, polish them up, and submit them to our acquisitions editor. We’ll see what happens from there. I also have a novel I started the first year of the Haunted Mansion Writer’s Retreat that I want to finish up. It’s based on the same time period as the actual house and is about the creation of a haunted mansion from the ground up. It starts with workers dying during the construction. I’m learning a lot of Northern California history from the research. You can follow the unfolding plans for the next Haunted Mansion Retreat here: http://hauntedmansionwriters.blogspot.com/. This entry was posted in author interview, Blog tour and tagged ghost stories, Haunted Mansion Project, horror writers, Kim Richards. Bookmark the permalink. Interesting interview with an interesting lady. She is that. I can’t wait until her haunted house novel is done.